A unique forum as part of the WAYFINDERS Exhibition to expand the conversations around climate change impacts in the Oceania region. Talanoa, with a panel led by Seini Taumoepeau, with Pacific Creatives and Cultural workers sharing thoughts, ideas and vision for the region and communities. 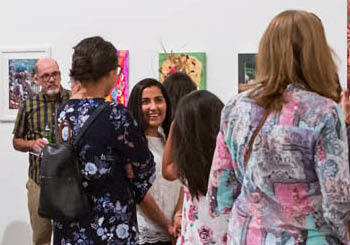 The Wayfinders exhibition at Casula Powerhouse Arts centre (11 October- 12 November 2018) is part of the Oceania Rising Project with Australian Museum and Blacktown Arts. Weave Parramatta will also be continuing with the community art installation- join in and add your woven fish-Saturday 10 November 3pm-8pm. From Malapo to Miller will be presented as part of Pacifica Festival: Talanoa. From Malapo to Miller will be directed by Emele Ugavule and will feature Taofia Pelesasa as Sione and Didi de Graaf as Si’I. Email rsvp@casulapowerhouse.com to confirm your attendance to this event. 12:30-1pm. Performance by Victoria Hunt. Hopper Gallery 3:30-6pm.